This is a very unique piece of undetermined age, but it’s old. The turquoise gemstone in this pendant is beautiful and looks like an heirloom piece with a solid silver back and heart-shaped toggle clasp. It’s solid and sturdy and is a signed original piece. If you are a turquoise fancier, this one’s for you. Free shipping USA. 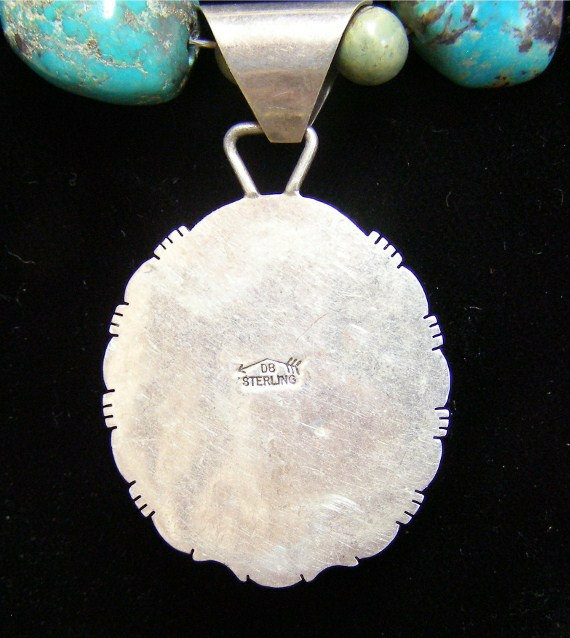 We’ve listed this beautiful pendant in our Vintage section. You can purchase this discounted 20% using the Coupon Code above which includes free shipping in USA. Every item in our inventory is handmade, except for items in our Vintage section,and once it’s sold it’s no longer available but can be special ordered. That’s it! No gimmicks, no tricks. If you like it you can buy it.